Back to the eighties is the nation’s only ‘80s themed act to truly capture the look, sound and attitude of the decade of decadence. Back to the eighties pay homage to the rocking ‘80s when amps went to 11, rock stars were heroes and big hair made the world go round ’n’ round - A time when music was all about partying, fast cars, dangerous women, and having nothin’ but a good time. Back to The Eighties has a whole swag of classic retro rock and pop in their repertoire to choose from, ranging from fist-pumping party anthems and dance hits to tear-jerking power ballads. 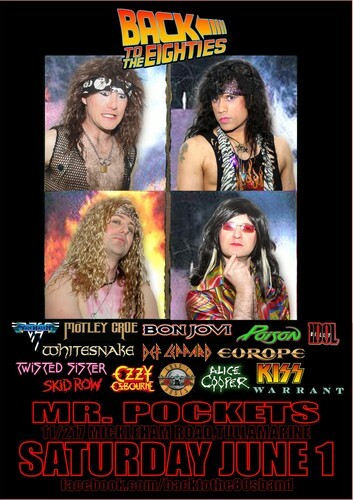 The back to the eighties live show is hair-raising, high spirited romp! The music and showmanship embodies the unrepentant excesses and glamour of the ‘80s era. Equipped with more makeup than your mother, hair that needs its own zoning permit, and pants that leave nothing to the imagination, these guys are prettier than your girlfriend!